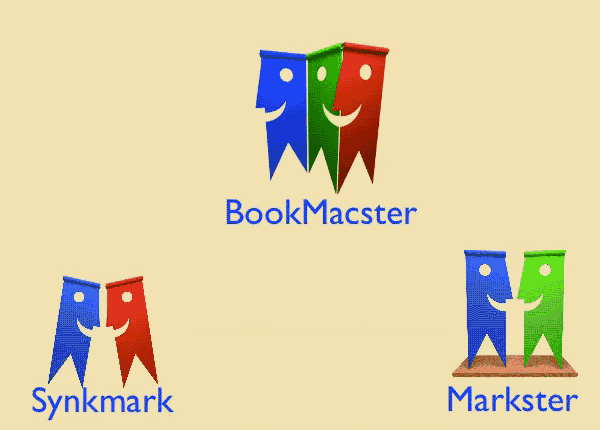 We now offer three bookmarks management apps. 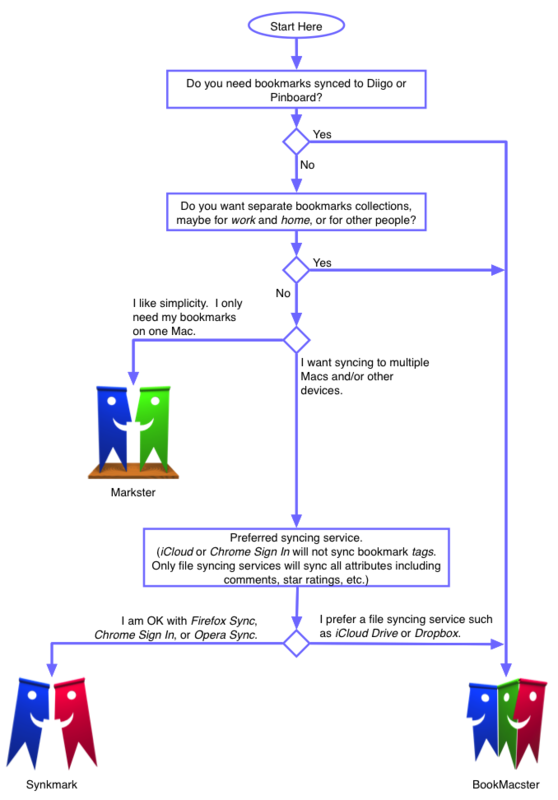 • Most new users will want Synkmark or Markster, which are each focused on a single, popular use case, as outlined below. • Power users who want all and more, and don't mind some extra setup and conceptual overhead, will prefer BookMacster. All three apps get the same level of support and updates as necessary, and indeed they all have the same smarts inside. The windows and menus in the three focused apps look the same as those in BookMacster, except for the absence of some menu items, tabs and other controls which are not needed for their focused use cases. In case your needs change, you can upgrade or downgrade from one app to another. I have been enjoying BookMacster as a way to manage my work and home bookmarks - have access and sync to different browsers for different purposes. Very handy. Quite an evolution from Bookdog and still serves me well! I tried the BookMacster demo. It really helps a lot managing bookmarks. Safari and Chrome are replicating just like FF. and I¹m impressed, it seems that FF is sorting almost automatically, so now, I don¹t really have to do a sort or migration once a month like I used to, it¹s all hands off now correct? I want to refresh from a master copy and control how it's applied. BookMacster is the closest to that work flow. I have been a happy BookMacster and, before that, Bookdog user for a long time. Smarky installed easily and works perfectly. Wow. Very cool. I dragged my bookmark shelf into the bookmacster app and it's all set up and ready to go! You rock! Thank you for all the hard work you put into this software to make it work so well! I have managed to learn how to use it and now it has been seamlessly syncing my bookmarks. Bookmacster is a great utility! Thanks it worked perfectly, now I can get about the task of de-cluttereding 17,000 bookmarks. It appears to be a good product and I've moved over from [Product X] which was a disaster. Man am I glad I gave it another chance. This software has made my life so much easier. I am super impressed by how well BookMacster works! I'm very impressed with the quality and thoroughness of your product by the way. I've been using (and sometimes reviewing) and sometimes creating, software since 1979, so I've seen a lot!. Your program is indeed pretty amazing, especially that it works automatically and hidden, I really like it. Also, the Bodega program works very well in keeping all my programs up to date, even those that I only use occasionally. I’m very impressed with both programs. I find the program invaluable. I've been using BookMacster for a couple of hours now and already love it. I am loving your product. The bookmarks are on safari and firefox on all my computers, and even on my ipad and iPhone … Thanks so much. When bookmark managers don't play nice with iCloud, things become a huge mess that I never want to spend time sorting out again (I've been there). Keep rocking the bookmark world! Thank you very much for your great software. I use both Safari and Chrome so it's very helpful. It worked beautifully! Can i just tell you how much I appreciate you? The application is working flawlessly and is superior to others i've tried. The app is working really well. I'm giving up on [Product X] for BookMacster.